"By crushing our cucumber before we cut it, we produce flavors that un-smashed cukes can't. When you crush the cells in a vegetable, as opposed to cutting cleanly through them, certain compounds get mixed together, which can result in a significantly different flavor. In cucumbers this is a good thing--onions, not so much. But this salad is one of my all-time favorite cold summer side dishes. The only decision you're going to have to make is how long to let the cucumbers marinate--half an hour or so or not at all." Wrap each cucumber in plastic wrap to minimize splattering. Place on a work surface and pound with a flat object (like a meat pounder) until cucumbers crack and are slightly flattened. Remove from plastic. Cut cucumbers in half; halve each side lengthwise. Slice into 1- to 1 1/2 -inch wide slices. Transfer to a strainer set over a bowl. Sprinkle cucumber with sugar and salt; mix until well combined. Refrigerate bowl and strainer for 30 to 60 minutes so cucumber pieces can drain into the bowl. Place garlic, seasoned rice vinegar, soy sauce, sesame oil, and red pepper flakes in a large bowl. Whisk together thoroughly. Transfer drained cucumbers into bowl with dressing. Toss to coat. Cover with plastic wrap; refrigerate for about 30 minutes to allow flavors to mingle. 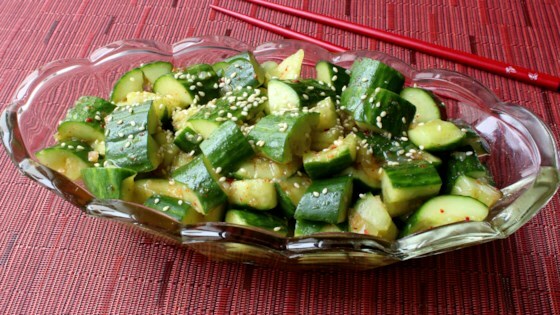 Place cucumbers in serving bowl and sprinkle with sesame seeds. In place of seasoned rice vinegar you can use plain rice vinegar and add an extra pinch of salt and sugar to the dressing. Somehow I was expecting more from this recipe it was good just not as delicious as I was hoping. I love this recipe, so refreshing and light at the same time! Thank you Chef John! I would use half the garlic next time.